This entry was posted in history, politics and tagged hooman majd, iran, newsha tavakolian, shiite, shirin neshat, ta'zieh, the ayatollah begs to differ by Michele. Bookmark the permalink. I usually keep up on the latest books on modern-day Iran but I’ve been busy and traveling a lot so I missed this one. I’ll have to read it. Michelle, you say, “I recommend it to Iranians especially if they have been living outside their country for a long time like me (30 years) . 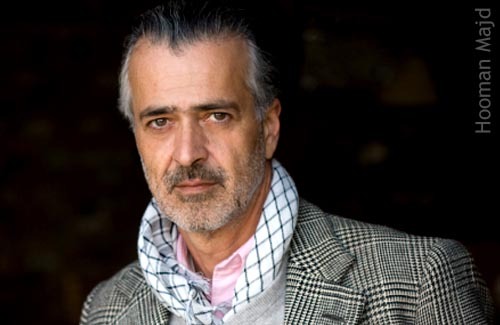 It will be interesting to non-Persians as well to glimpse the enigma of today’s Iran.” I am neither. Rather, I am an American who has been visiting Iran and traveling around the country since 1999. 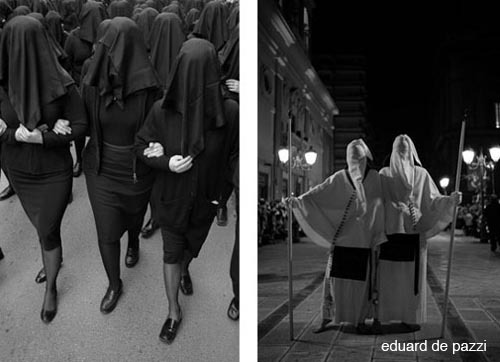 The woman walked through the narrow alley as our car approached, a black chador flowing gracefully from her head to the ground. 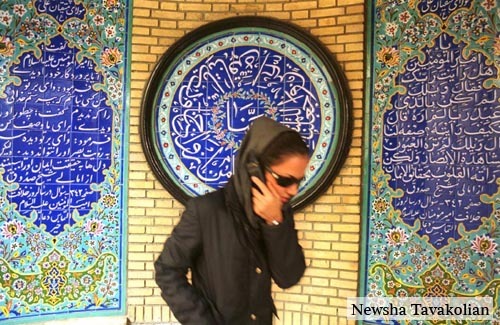 An older woman, I assumed, who favored the chador, the traditional one-piece covering, over the modern coat and scarf. But as we drew nearer the woman turned and the face I saw framed snugly in smooth, black cloth was that of a young woman. Books in hand, she was on her way to high school classes or perhaps university. My surprise quickly faded as we sped past. 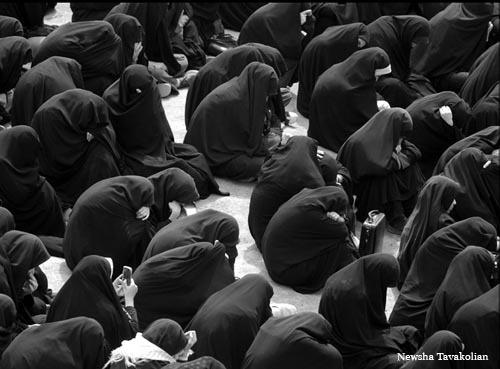 Many Iranian women of all ages favor the chador. It can be quickly draped over the latest fashions or used to cover a hastily donned, less fashionable ensemble. Within the confines of this narrow Tehran alley, lined tightly by painted brick walls, the chador seemed at first a symbol of traditional Iran. But the young face and school books are the face of modern Iran. Such superficial contrasts and seeming contradictions coexist with a harmonious convergence of old and new that is the foundation of modern-day Iran. These contrasts can also become the root of dissension and conflict. It’s these contrasts (they no longer seem contradictions to me) are a large part of what fascinates me about Iran. I need to finish that article but I think I’ll read Majd’s book first. Like always you did a great job. Very interesting subject. What a handsom writer! you always give good tips about books, music and movies to us. I shall buy this book. I’m receiving a lot of compliments about your website from my friends and family from all over the world. I guess you can start commercializing your website and accept ads. I’m proud to have such a talented and artistic friend. Michelle: A very fascinating read. I will definitely read that book. After spending some time this summer in Iraq I realize 2 very important things. 1) The media in the U.S. is lopsided in its presentation of Iran and the Middle East. The news is intended to “sell and sensationalize”. So this allows extremists to manipulate the media to present only things that will do just that “sell and sensationalize”. That is why a mall shooting in the U.S. or an Iranian government official saying something ridiculous gets the head line. 2) Through the eyes of you (and other friends from Iran) it is very clear to me it is a very fascinating place. Unfortunately we only get the politically expedient view with no sense of the diversity of the country or the people. It would be the equivalent of the Middle East thinking all Americans are white and members of the Ku Klux Klan. I liked your post. I have read Majd’s book, and I agree with you that it is an excellent book. 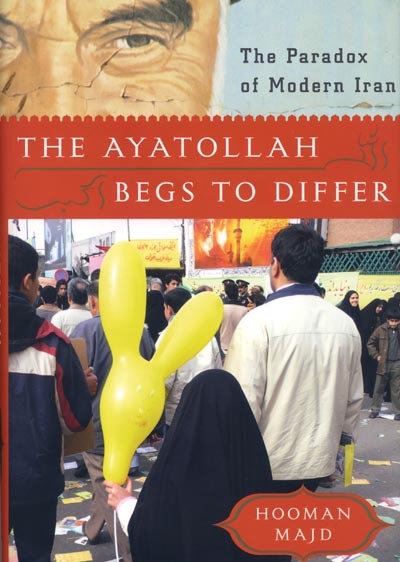 It is certainly much better than several other books written by “experts” that present skewed images of Iran which have little relation with the Iranian society and its paradoxes. I am not a great fan of Nasr’s book. It does provide some good information and insight, but there is also a tendency to look at things in a certain way. But, Majd’s book is excellent. I also liked the images and photos that you have posted with your writing about the book. It seems like a very intersting book. 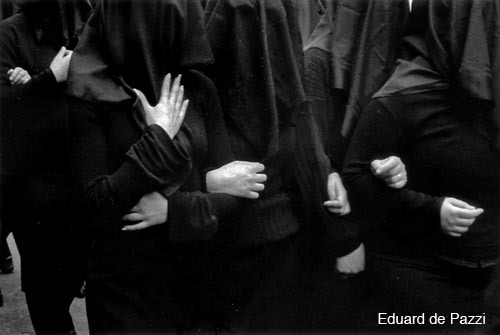 The photographs of Mourning Women was incredible. Also the Italian versions of Tazieh were a grrat surprise to watch. I havealways been intrigued bythe Dichotomy of your country, which i can relate to so much, as in India, Iran or Persia has been a country with whom we have had a great exchange of Culture in variety of domains ranging form Art and Architechture to Music and Cuisine etc.. However it’s the Modern Intellectual Iran within the Ayatollah’s Iran that makes it compelling. Thank you once again, Michele, for an enlightening post. In addition to the amazing photos, I particularly appreciated the YouTube clips. I learn so much from you. Several times, during my reading, I have thought I discovered an incoherence or a mistake. But so far, each time when I reread the passages, I see that it is I who have misunderstood some of the nuances in his writing. An example of this comes when Majd writes “Iranians overthrew a twenty-five-hundred year monarchy in 1979…”. My first thought was that this wasn’t taking into account the democratic period which led to the the Mossadegh government in the early 50’s. But of course Iran was a constitutional monarchy at the time, so Majd is correct after all.